If you are Confirmation-seeking adult who is a member of Blessed Sacrament parish or St. Moses the Black, please connect with Marian Bart (313-883-2869) to discuss your sacramental needs. If you are an adult who doesn’t yet have a parish or who just wants to talk about God, being Catholic, sacraments, or other aspects of faith, Marian would love to chat with you! If you have a child from our parishes (Blessed Sacrament/St. Moses) who needs sacramental preparation of any kind, please connect with Yvonne Graves by calling 313-865-6300. 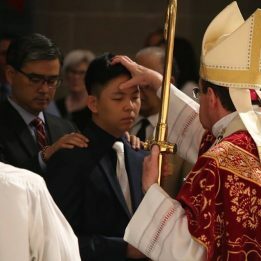 The sacrament of Confirmation for Catholic adults who are both open and prepared is held at the Cathedral of the Most Blessed Sacrament twice a year, on the Feasts of Pentecost (late spring) and Christ the King (late fall). Adults who desire Confirmation should contact their own parish formation leader – probably a DRE, PCL, or pastoral associate. The parish will provide the necessary formation to prepare you for reception of this sacrament. Your parish is responsible for discerning your readiness and registering you for the celebration. The Office of the Archbishop makes registration available through “Parish Mail” 4 to 5 weeks prior to each celebration. You may need to gently remind or educate your parish leader about this important step in the process because sometimes many years can pass between adult confirmations from any one parish. Typically, on the Confirmation days, reserved seating is held for each candidate and accompanying sponsor by use of ‘tickets’ given to their parish leaders, with some leeway built in for correction of any mishaps. The remaining seats for friends and family are available on a first-come, first-served basis.